Silicone is a fantastic material for masks. It provides intense realism, both in the sculpted detail and the way the material moves. It has enough stretch to move with your facial expressions in a way that looks completely real and natural. Silicone is also much more durable than latex, won't degrade from the oils in your skin, and lasts much longer. Silicone masks also fit better than latex because the material is more flexible, like a second skin. In general, silicone is superior to latex in every way. Overall, there are very few things better than a silicone mask for transforming yourself completely and realistically, within a couple of minutes! 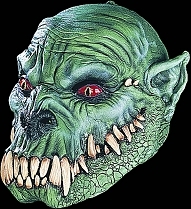 At Halloween-Mask.com, we carry a selection of top-quality silicone masks perfect for portraying a wide range of characters. These masks are incredibly lifelike and will definitely make you stand out from the crowd!